You can find here short news items about the Society. This includes reports on recent events like Forums. Since the Society is run by volunteers, we rely mostly on people to send us news items. In particular, presenters of Forums are asked to contribute a short note on their presentation and/or a copy of the PowerPoint handouts. For ease of loading such information on the web site, we have to lay down strict guidelines for these contributions. Click here for these guidelines. On the 25th April 2019: Event by the UK National Heat Transfer Committee, a one-day workshop on: Heat Transfer Research, Education and Practice in the UK; co-located with the Thermal Engineering Show at the Roundhouse in Derby. The UK NHTC committee are inviting specialist speakers to contact them if they have an interest in joining their workshop covering the Heat Transfer topics listed in the attached flyer, where the workshop is due to be held in Derby on the 25th April 2019. Contact details are on the UK NHTC web site as shown in the attached flyer. Please note that any Heat Transfer Society member applying to, joining or speaking at this workshop will be doing so on their own behalf as an individual or on behalf of their companies, but members are not to claim to represent the hts or to present on behalf of the hts. Hopefully it will be a very successful event. 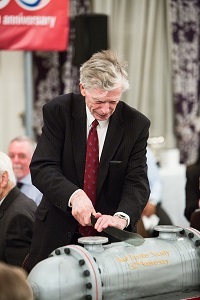 At the hts Annual dinner in March 2019, the Charity Raffle collection for the British Heart Foundation raised �990. 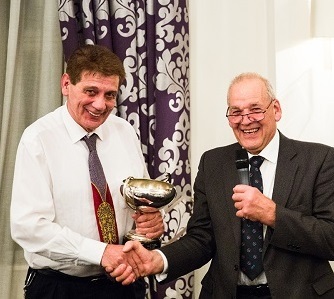 At the society's AGM on the 5th March 2019, Russell Skinner stepped down as the society's Honorary Chairman and David Norton was elected as the new Honorary Chairman. There were no other changes to the committee at this AGM and all the previous committee members were re-elected onto the committee. At the hts Annual dinner in March 2018, the Charity Raffle collection for the Great Ormond Street Hospital raised �977. 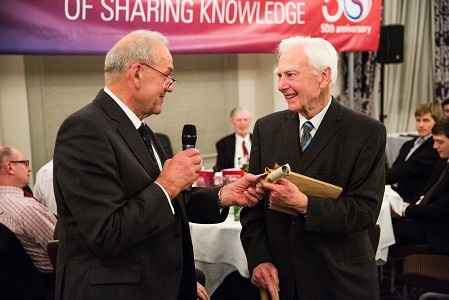 The society celebrated its 50th birthday at our Annual Dinner at the Connaught Rooms in London on Friday 28 March 2014. Over 200 people attended. We invited as many past presidents as we could find to the event and 19 joined us. These were Claudet Beyer, Reg Bot, Dave Butterworth, Barry Crittenden, Ron Cowie, Alan Davis, Alan Deakin, Alan Guy, Peter Heggs, Geoff Hewitt, Dave King, Bob Marsland, Mike Moore, Michael Morris, David Reay, John Rose, Brian Spalding, Ron Spear and Eddie Watters. 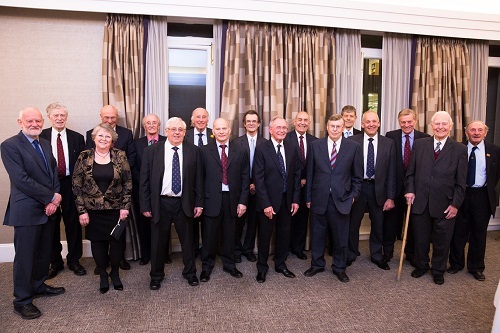 Past presidents along with Martin Gough (Chairman) and Joe Quarini(New President). This does not include all past presidents as we could not tempt some out of the bar! 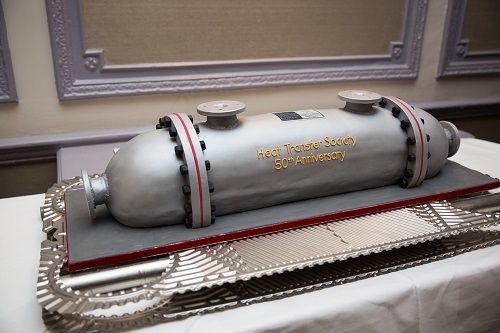 No birthday would be complete without a cake and ours was a splendid affair in the shape of a shell-and-tube heat exchanger. This was carried into the dining room on plates from a plate heat exchanger. When the time came to cut the cake, this was done by one of our most distinguished past presidents, Geoff Hewitt. 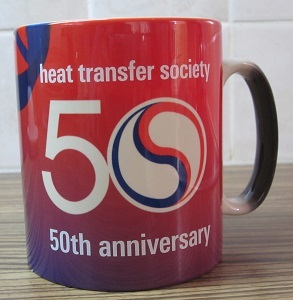 The highest honour bestowed by the Society is its Fellowship, which is given to someone who has given long and distinguished service to heat transfer. This year's Fellowship went to Reg Bott. He was also presented with a copy of his auto-biography which had been signed by many of those attending the dinner. 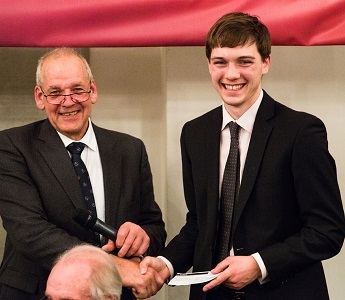 The 2014 hts Award of �1000 for the best undergraduate project on heat transfer went to Peter Forsyth of University of Oxford. The Mike Akrill Award for the best Forum presentation during the last year went to Blazo Ljubicic of Koch Heat Transfer. 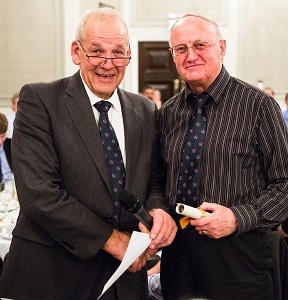 Two members, Ron Spear and Mike Moore, received life memberships from the Society in recognition of their long service to the Society. 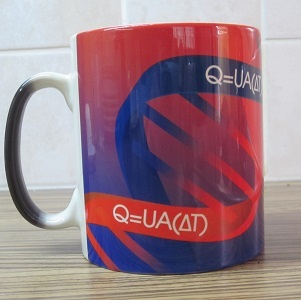 All those attending left with a commemorative mug. At first sight, the design of this is, as can be seen below, appears somewhat dull, though, I suppose, elegant. However, the addition of a hot drink brings out its full glory. 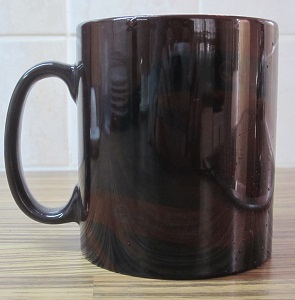 Some of you may spot that most of the handle remains black when there is hot liquid in the mug. There must be an explanation of that but it would need a heat transfer expert to explain it! Many more pictures of the event were taken than are shown above. These were taken by a professional photographer, James Gifford-Mead who holds the copyright to the photographs. You can view all the pictures here. The password to access these is heat. 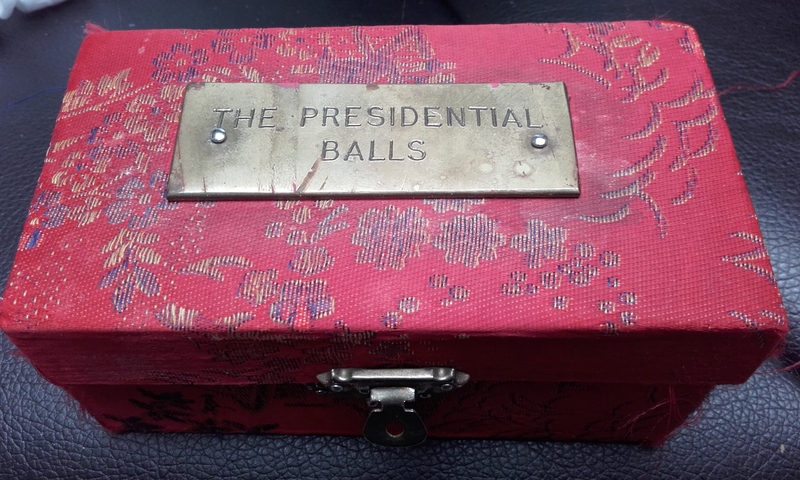 The Presidential "Balls of office" are passed each year from the outgoing President to the incoming President. 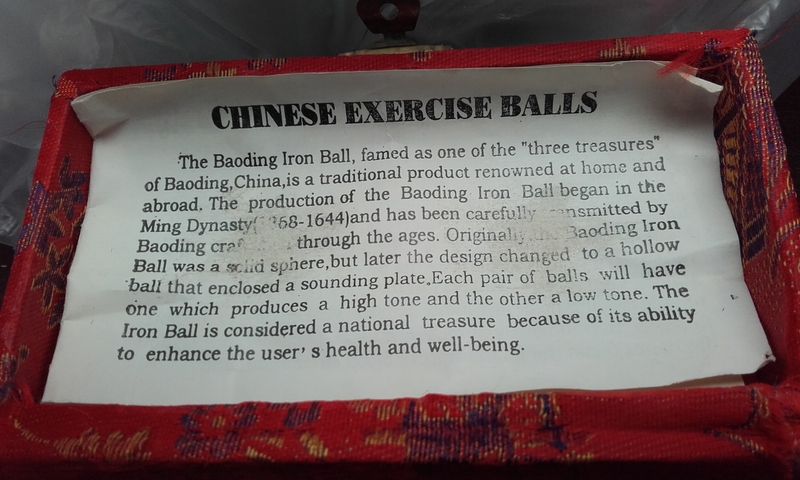 These Chinese balls were originally acquired by a society member while visiting China where he noticed that the logo on the balls had some similarity to the hts logo. The dinner was held in the Grand Connaught Rooms, London on Friday 22 March. The dinner was attended by around 140 hts members and guests. There were 14 sponsored company tables. 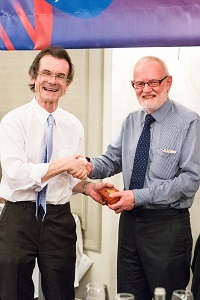 Prof. Barry Crittenden was inaugurated as our new president taking over from Ron Spear. The Mike Ackrill Award for the best Forum presentation last year was presented to Ian Gibbard. The hts Award for the best student project paper was presented to Jonathan Harris of the University of Surrey. 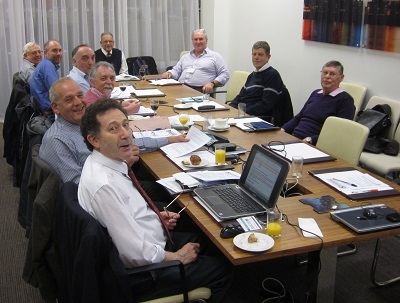 The meeting was held on Thursday, 7 March 2013 at the offices of IHS in London. Thanks are due to Simon Pugh for arranging this venue. At the meeting all current Management Committee members were elected for a further year. It was also agreed at the meeting that the committee should consider whether there was any advantage to the Society to become a registered charity. The committee will report back to members at the next AGM. The meeting considered the forums presented over the last year and were pleased to give the Mike Ackrill Award to Ian Gibbard of Progressive Thermal Engineering for his excellent presentation on troubleshooting steam surface condensers. Download presentation slides (pdf 1.6 mb). The Chairman, Martin Gough presented his report on the previous year and this is given in the next news item. Again it is my pleasure to report that the Society remains strong and continues to grow with 6 new members joining in this year. This is fewer than many previous years and certainly not as many as we would want. Recruitment continues to be on our priority list and we constantly strive to find new openings and opportunities of promoting the Society. We look forward to celebrating our 50th year next year. Your committee will consider an event next year to mark this occasion, suggestions are welcome. Next year's dinner should, I believe, be an extra special event so please spread the word that we want everyone to come with as many of the past member, retirees and associated friends of the society that we can persuade. The meeting was held at The Barley Mow, London and was attended by 8 committee members and 1 member (K Baksh). As there were no additional nominations for officers, D Evans and C Weil proposed and it was seconded by K Baksh & S Earland that all current officers be proposed and re-elected. The nominations were elected unanimously. A list of all elected can be found in the Minutes (pdf, 21 KB) . This was held again at the Grand Connaught Rooms, London where 126 members and guests attended. This number was down on previous years but the evening as always was enjoyed by all those in attendance. It was noted that there were a number of overseas visitors who were welcomed. Also during the dinner the 2012 hts Award for best project was presented to the winners Chris Macnair and Matthew Tatner from Strathclyde University. The winners were joined by their tutor Dr Mark Heslop. 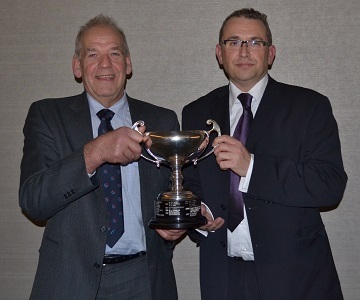 The 2012 Mike Ackrill Trophy was won by Simon Pugh for his presentation on "The next generation of software for managing fouling". The raffle raised �799 for McMillan Nurses a charity chosen by Nigel Smith's family. Raffle prizes were kindly donated by HTRI. It is with great sadness that we learn of the death of Nigel Smith after a long fight against cancer. The funeral will be held at the Chilterns Crematorium, Whielden Lane, Amersham, Bucks, HP7 0ND at 1.00 pm on Friday 14th October 2011, and Nigel�s family are organising refreshments afterwards at the Hit or Miss Pub in Penn Street, Amersham. Flowers will be from the family only and they have asked for donations to be sent to Macmillan Cancer Support. Nigel was an active member of the Heat Transfer Society for nearly forty years and has been a stalwart of the Society for most of that time. He probably holds the record for the greatest number of Forum meetings attended, even if sometimes a little late. He was a familiar face at both Forum meetings and committee meetings even during the later stages of his illness. Nigel has been an active member of the management committee of the Society from the early 1980s right up to the present day, and he had the responsibility of looking after the Society�s rules. He took over from Jeff Downey as Treasurer in 1984 and held that role for five years until Dave Evans took charge of the purse strings. Nigel was Chairman of the committee for four years from 1986, when he took over from Chris Norman, and it was Nigel that introduced the tradition of the Chairman being in office for longer than one year. Many of us can still remember Nigel�s legendary speeches at the Annual Dinner. In 1990 Bob Berryman became Chairman when Nigel went to work in Glasgow for a couple of years. The 1980s was a difficult time for the Society and for three years Nigel was both Chairman and Treasurer. He also found time to organise the annual Ladies Night when members and their partners would enjoy a Dinner Dance at a London venue. He also organised the January Social � a somewhat less salubrious event for members. Nigel will be sorely missed by his family, friends and colleagues. On Tuesday 13 September 2011, Simon Lo from CD-adapco gave a presentation on CFD modeling of multiphase flows in the oil and gas, chemical and process industries. In recent years there has been a phenomenal increase in the use of Computational Fluid Dynamics (CFD) by all industries in their design studies and trouble-shooting analyses. A small selection of examples were presented to illustrate the benefits one can obtain from such analyses. Examples in Oil and Gas included coupling of 3D-CFD with 1D-OLGA for multiphase flows in long pipelines, dynamic forces due to slug flow in pipe bends, effects of cooling in transport of viscous oil, and wave impact on platform. Examples in Chemical and Process included temperature profiles in shell and tube heat exchangers, multiphase mixing vessels, pneumatic conveying of particles, and compact heat exchangers. This was a joint meeting organised by HTS and SONG held at the IChemE offices in London..
You can download a file of his presentation here (pdf file 5.2 MB). As with the previous year, I am happy to record that the 2010 Annual Dinner held at the New Connaught Rooms exceeded expectations, with a total of 171 attendees, the highest ever recorded. 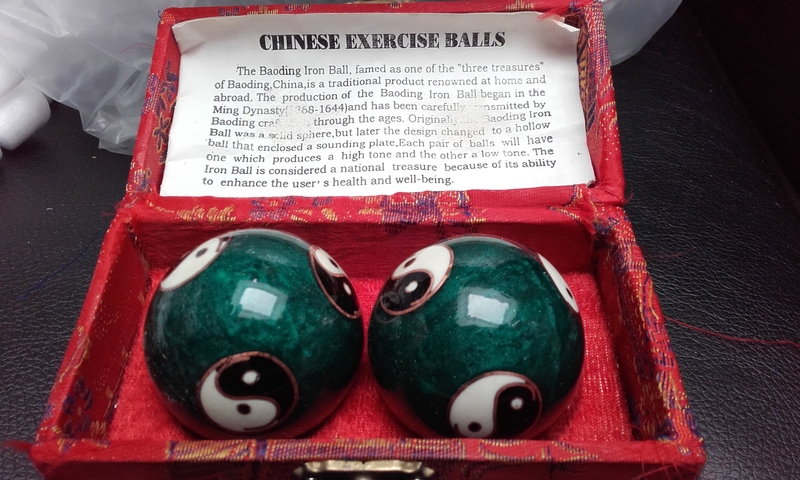 Among the highlights was the inauguration of Dave King of BP after receiving Claudette's balls which she returned accompanied by an impromptu monologue. It was noted that the formal part of the dinner should finish in good time in future in order for attendees to have enough time to network (drink!) which is probably the most important reason for their attendance. The raffle raised �863, all monies being donated to Cancer Research UK. Finances remain strong with the highest bank holding on record. The stable revenue being received by the Society, even in these more financially challenging times, gives confidence to the Society's decision to fund the hts award. We just need to find a good recipient this year to establish the concept with all potential research establishments. Attended by some 6 members who managed to find the new prestigious offices of ESDU kindly lent to the Society for the evening, providing also sustenance to compliment the quality of the ambiance. All current members of the committee offered themselves for re-election and were duly elected. Dave gave a very well thought out presentation with useful information outlining the the view heat exchanger design and operation through the eyes of a purchaser and user. Our Annual Dinner was held in the Grand Connaught Rooms, London an 26 March and had 171 attendees. Dave King of BP Exploration Operating Company was installed as 2010 hts President. The charity raffle of John Lewis Partnership vouchers raised �865 in aid of cancer research UK. The Annual Dinner was held on Friday 27 March at New Connaught Rooms, WC2. The main event of the evening was that Claudette, Heat Transfer Research, President and CEO was installed as our president for 2007/08. The charity raffle raised �650 for RNLI. The Annual Dinner was held on Friday 30 March at New Connaught Rooms, WC2. The main event of the evening was that John Rose, Professor of Mechanical Engineering at Queen Mary, University of London, was installed as our president for 2007/08. This lively evening was well attended with 144 members and guests on 14 tables. Ten past presidents were at the event. The Mike Ackrill Award went to Luc-St�phane Schroeder of Chromalox International for his talk on, "Impedance Heating Heating and Melting using TPC Technology," given in London on 21 November 2006. The Charity Raffle raised 712 pounds for The Cancer Treatment and Research Trust. The raffle prizes were donated by HTFS/AspenTech. This year's dinner was held a little earlier than usual because of the early Easter. It was attended by 143 people. The raffle raised �535 for the NSPCC from prizes kindly donated by Cal Gavin. Alan Deakin of BP was inaugurated as our President for 2005/6. Derek Jackson of the University of Manchester received the Mike Ackril Award and Eddie Watters was made a Fellow of the Society. Is Heat Transfer Good for You? David Reay gave a wide-ranging talk to HTS members, and some invited from HEXAG and PIN, covering the areas of heat transfer which can affect, positively or adversely, our ability to function at work or play. It allows us to produce edible hot food and 'quaffable' cold wine! Human comfort depends upon many factors, and David described the role of 'active' and 'resting' sweat glands and the ways in which they function. Could we influence human thermoregulation in a way that could minimise our need for space heating and cooling? Or can we design clothes that mimic thermoregulation - a new form of wool which opens and closes like pine needles to trap or expel heat is one answer! The benefits of heat exchangers can be realised to a greater extent when they are combined with other process unit operations. The chemical and process industries in general are already benefiting from 'process intensification' - making plant much more compact without sacrificing throughput. Taking as an example the Chart Heat Exchangers 'HEX-reactor', David showed how catalytic reactions and heat transfer could be beneficially combined in structures that resembled compact heat exchangers. Such technology could even lead to the 'gas turbine reactor', where the combined production of heat, power and chemicals would be carried out. 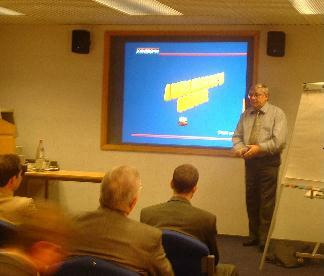 A theme throughout the talk was the heat pipe, which has interested David for most of his working life. As well as mimicking 'resting' sweat glands, they can be used to cool aircraft brakes, isothermalise space satellites, and cook meat. 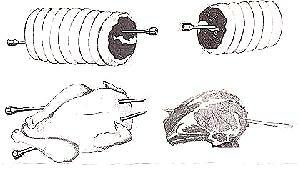 The 'heat pipe cooking pin' allows you to cook roast beef so that one half is rare and the other half well-done - in the words of the manufacturer "Stick it halfway in and individual tastes are satisfied. In conclusion, David said: "We will soon have to take our jackets off, wear wool vests full of spikes, sit at 'hot' or even 'cold' desks and eat food which looks like Swiss cheese! - (full of holes for cooking pins)". Global warming was the subject of much of the discussion, after all it may well influence our future heat transfer activities in a massive way. However, there were some sceptics present! For example; "Are our data, which shows a steady rise in global temperatures, influenced by measurements being made in 'warm' city environs?" A question for the Prime Minister as he addresses our greatest threat, perhaps? Dave Butterworth became interested in multistream exchangers after becoming Chairman and General Secretary of the Aluminium Plate-fin Heat Exchanger Manufacturers' Association (ALPEMA). He gave a Forum presentation on 20 April at which he explained the some of the intricacies in the construction of such equipment and the benefits that they can have. 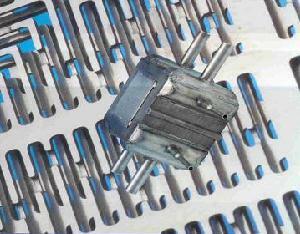 Those in which at places in the exchanger, heat can be exchanged between a number of hot and cold streams. Dave concentrated on the latter type with the aim of the talk of introducing those familiar with two-stream exchangers to the exciting feature of multistream exchangers. At the London Forum on 25 September, Dave Butterworth reviewed the developments in various aspects of process heat transfer from 1960s until today and then suggest how things might be in 2010. Interrelated topics covered included the developments in software, availability of heat transfer expertise and the evolution of heat exchanger types. For the most part, it was suggested that the changes will be modest. The suggested developments are the personal views of Dave rather than a consensus view of the industry. So the Dave's suggestions prompted a discussion from the audience including apposing viewpoints. This presentation was a repeat of a Keynote lecture given at the 8th UK National Heat Transfer Conference Oxford, 9-10 September 2003. The paper has now been published in Applied Thermal Engineering, Vol. 24, No. 8-9, June 2004, pp. 1395-1407. It is with great sadness that we announce the death of Archie Reid on 10 May 2003. 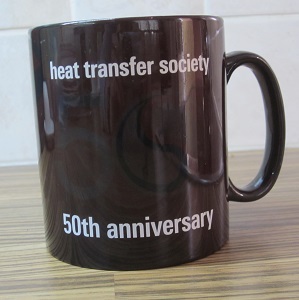 Archie was one of the founder members of the Heat Transfer Society with Membership No. 3. When the Society was formed on 23 October 1964, Archie was appointed Treasurer, a post held for 10 years. In 1972, a London & South East Section of the Society was formed, for which Archie was appointed Chairman until the section was absorbed back in to the main Society 8 years later. Archie was an Auditor of the Society for 20 years, a post which he held up to the end. In recognition of of his great service to the Society, he was made our President for 1992/3 and is one of the few people who are honourd as a Fellow of the Society. He was a mentor to many in the industry and will be greatly missed. Dave Butterworth as a self-confessed old timer, gave a presentation on his experiences of heat exchangers which were apparently well designed and clean but failed to achieve the design duty by a wide margin. One key to understanding this is to realise that, when trying to achieve high thermal effectiveness, anything that can go wrong will go wrong. He gave an analogy of climbing Everest being similar to designing an exchanger with high thermal effectiveness. Single-phase exchangers present particular problems when going for the summit of high thermal effectiveness but boiling and condensation duties give additional problems. Dave described the phenomena which could occur in single-phase, boiling and condensation and illustrated this with a number of real examples of problem heat exchangers. He also suggested ways in which the current heat-exchanger software could be adapted to iron out some of these problems at the design sage. The presentation provoked a members of the audience to share their experiences with problem heat exchangers. Hans Zettler talked about his PhD research work and this is illustrated by the following abstract to on of his papers. The flow pattern of water in a corrugated heat exchanger channel has been investigated using the non-invasive technique of Positron Emission Particle Tracking (PEPT) in a plate heat exchanger (PHE). PEPT allows an individual neutrally buoyant particle moving at speeds of up to 10m/s to be tracked in three dimensions to within 1mm or less. The technique produces particle trajectories and velocity profiles, and has also been used to detect low flow velocity and re-circulation zones in the flow channel. In addition, it allows for the determination of residence time distributions over a variety of flow rates, plate corrugation angles, and plate set-ups (side- and diagonal flow). PEPT data obtained at the University of Birmingham is compared to data obtained by visual observation and fouling experiments obtained at the University of Surrey, to identify how different flow paths influence the fouling behaviour in a PHE. The 39th Annual Dinner held at the New Connaught Rooms in London was a great success and was attended by 144 people. 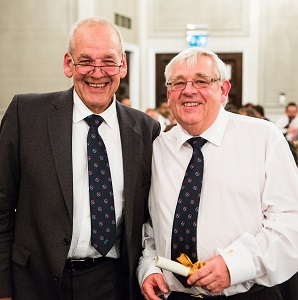 After Chairman George Bowes briefly described events of the past year, outgoing President Mike Moore inaugurated Bob Marsland as President for 2003/04. Bob made a short speech and toasted the Guests. Claudette Beyer responded on behalf of the guests and toasted the Members. The Mike Ackrill Trophy was awarded to Robert Ashe and Richard Barker of Ashe Morris for their Forum presentation on "New Areas in Heat Transfer". Jeff Neviile, a past president was made a Fellow and Life Member for his services to the Society and the heat-transfer industry. The raffle raised � 491 in aid of The Primary Club which supports blind and partially-sighted cricketers. This charity was chosen in memory of Bob Berryman, long time Society Member, who sadly died early this year. At the AGM, Mike Moore and Dave Gibbons were elected on to the Committee to replace the late, and sadly missed, Bob Berryman and to replace Gareth Fry who has moved jobs and is no longer involved in heat transfer. Dave Evans was elected a Trustee to replace Alan McKerracher who has move abroad. 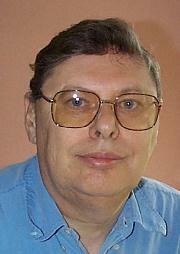 Robert Ashe, the director of Ashe Morris, was chosen to receive this year's Mike Ackrill Award for his forum presentation entitled New areas in Heat Transfer presented on 17 September 2002. 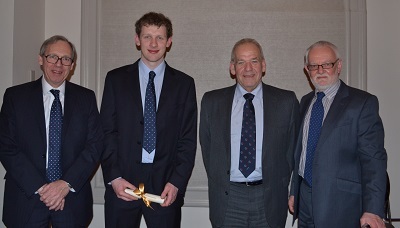 From left to right, Simon Earland, Treasurer, George Bowes, Chairman and Colin Weil, Secretery. Mike Moore, Chief Mechanical Engineer of John Brown Hydrocarbons Limited is this year�s President of the Heat Transfer Society joining a list of well respected past presidents. John Brown Hydrocarbons Limited hosted this year's event in Paddington and for this Mike chose to expand on the theme of his inaugural speech entitled "A Brief History of Heat." Mike gave an overview of heat transfer from the first taming of fire (half a million years ago) including baking (Circa 20,000BC), Pottery (~6,500 BC), metalworking (~2,000BC) and distillation of rice beer to make sake (~800BC). Into the modern era, the first steam machine was Hero�s Aeolipile in the first century AD), distillation of alcohol in Europe (~AD 1,000), steam power (17th century onwards) and oil distillation (19th century) and so through to the present day. 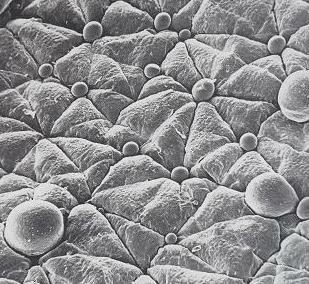 "We can feel heat, see its effects and use its properties - but what is it? As a form of energy, it has helped to shape our world, our environment and our civilisation. Man has harnessed heat for both good and evil, but can he compete with nature in the awesome effects of heat?" The presentation was very well received and prompted a wide ranging discussion with particular emphasis on environmental issues that had been raised both directly and indirectly from the talk. George Bowes, the Chairman of the Heat transfer Society, concluded the evening with thanks to John Brown Hydrocarbons Limited for the hospitality, and to Mike for a talk that was topical, thought provoking and which was of interest to all those present.